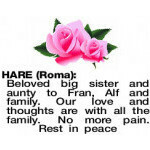 Family and friends are invited to attend the Celebration of Life Service of Roma Frances Hare (nee Triat) to be held at Christian Funerals Chapel, 302 Whatley Crs Maylands on FRIDAY (5.4.2019). 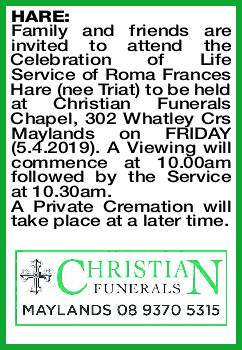 A Viewing will commence at 10.00am followed by the Service at 10.30am. Left us peacefully 23.3.19. Loving Mother of David, Margaret, Jennifer and families. Sister of Shirley, Veronica, Margaret and Frances. 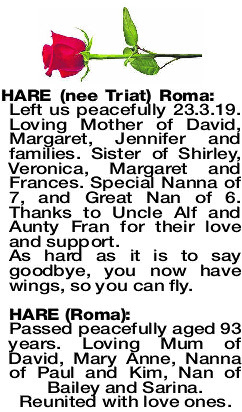 Special Nanna of 7, and Great Nan of 6. 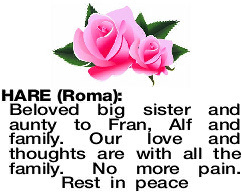 Thanks to Uncle Alf and Aunty Fran for their love and support. As hard as it is to say goodbye, you now have wings, so you can fly. Passed peacefully aged 93 years. 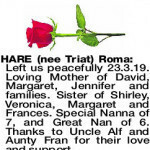 Loving Mum of David, Mary Anne, Nanna of Paul and Kim, Nan of Bailey and Sarina. Reunited with love ones. 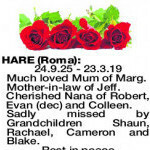 HARE ROMA 24.9.25 - 23.3.19 Much loved Mum of Marg. Cherished Nana of Robert, Evan (dec) and Colleen. 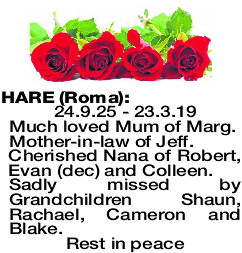 Sadly missed by Grandchildren Shaun, Rachael, Cameron and Blake. 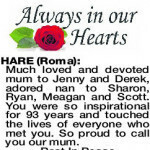 HARE ROMA Much loved and devoted mum to Jenny and Derek, adored nan to Sharon, Ryan, Meagan and Scott. You were so inspirational for 93 years and touched the lives of everyone who met you. 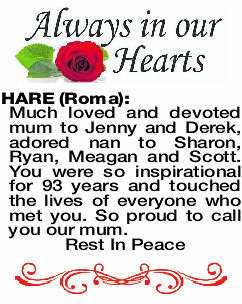 So proud to call you our mum. 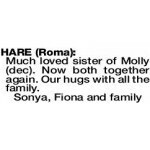 Much loved sister of Molly (dec). Now both together again. Our hugs with all the family.